How do the bees handle the cold? Beekeeping is a fascinating and rewarding hobby. 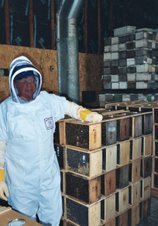 If you have ever been interested in keeping bees, this is your opportunity to learn from a Certified Master Beekeeper. Call Century College 651-779-3341 to register. I have mailed out package bee order forms. If you don't get an order form by Wed. call or e-mail me. I may not have your address. There is a beekeeping workshop in Menomine, WI. It is put on by the Dunn County Beekeepers and the Univ of WI - Extension. What's Happening in the Hive right now. The warm weather has been a good deal. The bees should be able to shift their cluster around, hopefully to be on new frames of honey. If you went out to peek under the inner cover you should notice the bees have moved up into the top box. If there was a lot of honey below they might not have moved up yet. This time of year a hive uses around 12 - 14 pounds of honey a month. Which is about a deep frame and maybe a half of one. The hive continues on this pace of honey consumption until mid Feb. when brood raising starts and honey consumption goes up considerably. The bees will be going on cleansing flight tomorrow Sat. The high of 34 degrees and the sun will be just right for this. The bees will fly out of the top entrance, fly out, poop and fly back into the colony. It is normal to see dead bees around on the ground dead in front of the hive. It lists basic information. Contact information, package bee and queen pricing. I will be sending out package bee order forms next week. This Robin has been coming to my heated birdbath lately. I put out my trail camera and took his picture. The date and time is wrong and the temperature today was around 7 degrees F.
I also have had two Eastern Bluebirds and Mourning Doves within the last week. NEW YORK – A pesticide that could be dangerously toxic to America’s honey bees must be pulled from store shelves as a result of a suit filed by the Natural Resources Defense Council (NRDC) and the Xerces Society. In an order issued last week, a federal court in New York invalidated EPA’s approval of the pesticide spirotetramat (manufactured by Bayer CropScience under the trade names Movento and Ultor) and ordered the agency to reevaluate the chemical in compliance with the law. The court’s order goes into effect on January 15, 2010, and makes future sales of Movento illegal in the United States . In June 2008, EPA approved Movento for nationwide use on hundreds of different crops, including apples, pears, peaches, oranges, tomatoes, grapes, strawberries, almonds, and spinach. The approval process went forward without the advance notice and opportunity for public comment that is required by federal law and EPA’s own regulations. In addition, EPA failed to evaluate fully the potential damage to the nation’s already beleaguered bee populations or conduct the required analysis of the pesticide’s economic, environmental, and social costs. Beekeepers and scientists have expressed concern over Movento’s potential impact on beneficial insects such as honey bees. The pesticide impairs the insect’s ability to reproduce. EPA’s review of Bayer’s scientific studies found that trace residues of Movento brought back to the hive by adult bees could cause “significant mortality” and “massive perturbation” to young honeybees (larvae). According to the U.S. Department of Agriculture (USDA), bees pollinate $15 billion worth of crops grown in America . USDA also claims that one out of every three mouthfuls of food in the typical American diet has a connection to bee pollination. Yet bee colonies in the United States have seen significant declines in recent years due to a combination of stressors, almost certainly including insecticide exposure. Please think about attending this Banquet. The banquet is a fund raiser that helps the Univ of MN beekeeping program. It is fun and have some great fellowship with your fellow beekeepers. All beekeepers are welcome, you don't have to be a club member. I get the question all the time of what race of bees is the best. While I have my personal favorite, I have found trying the different varieties gives a beekeeper a better understanding of his or her craft. Every breed has different qualities that a beekeeper likes or dislikes. Some bee breeds are more hostile than others and I stay away from those. Other than that experimenting is fun and educational. But it is to easy to say a race is good or bad by trying it only once. It takes 4 or 5 years of a race to get a true feel of how they perform. Right now I am waiting for my 2010 pricing from my bee supplier. I expect to have it in 2 to 3 weeks. Usually it comes after the ABF convention. Here is a link to the convention. The itinerary is quite interesting. The location is Orlando, Fla. I wish I could go. Today is Jan 1 2010. New Year resolutions are being laid out all over the world. A new year for beekeeping is here. It is time to get into the beekeeping mode. I am planning to do a major housekeeping chore of getting rid of much of my old comb and old boxes. The comb on many of my colonies are now over 10 years old. 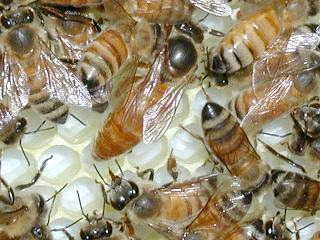 They have seen many different hive treatments that with time can build up in the brood comb. This type of cleaning can help with better queen viability, less chalkbrood and nosema and a general better well being of the colony. I know I will take a decrease in honey production with all the new comb that the bees will have draw out but, in the big picture it will set me up for more successes in the future. So the New Year resolution will be, new comb for better bees. My bees will be healthier and much better off.